The Swan Family Home is Flathead Lake-front property, perched above the water in a woodsy, private, and quiet setting. Watch the kids from the many decks as they swim from the private, gravel beach. Listen to the circling osprey and the waves on the shore. Enjoy campfires and 'smores' on the beach with the kids. Influenced by Frank Lloyd Wright, the home was designed and built by an artist-engineer. The interior has unique, handcrafted features: stone fireplace, curving spiral stair, and picture windows to follow the changing light. Two of the bedrooms have their own decks. The unique character and charm does not mean you have to suffer. The year-round home is comfortable with central heat, AC, and modern appliances: Full kitchen with double oven, 5-burner electric range, microwave, dishwasher, washer/dryer, all cooking and eating utensils, and bed linens furnished. Gas BBQ. Wireless Internet. There is a two-car garage, and a shed with wood for that morning fire with your coffee. Come enjoy the beach, the wild animals, and the quiet: canoe, swim, and relax to the sounds of the water. Owners: Mac and Karen Swan; Mary Swan and her son Ken. 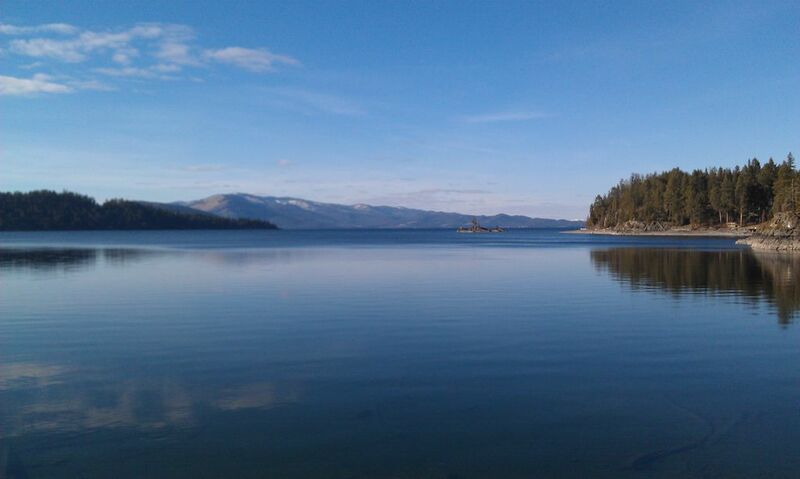 We grew up on Flathead Lake and have lived and worked in Montana throughout our lives. One of the unique areas on Flathead Lake, Cat Bay is particularly remote with the old-time feel of Montana the way it used to be. We offer modern amenities in a quiet setting. You'll wish you could stay on and on. Built as a family project over years, the original cabin was framed in 1957, bedrooms and bath added in 1964, garage, studio and third bedroom and bath completed in 1969. Entryway completed in 1972. We finished an extensive updatingl in 2017 with new flooring, counter tops, sinks and faucets. The Swan Family has enjoyed these three timbered acres away from the cares of the world, the clear waters lapping against the gentle gravel beach, the calls of the osprey overhead and communing with the animals who make their home here too. Bliss is lingering over coffee on the sunny morning deck--fledgling hawks casting quick shadows through the timber during their flight lessons to the knock of pileated woodpeckers on the pines. 200+ feet of beautiful gravel beach, firepit for those smores late at night. 17 foot aluminum canoe with paddles and pfds is provided.